BUCKY: Thanks, Dad! Mom says, if you hadn’t made the stork visit her...she’d be married to Uncle Fred! And I’d be my own cousin! 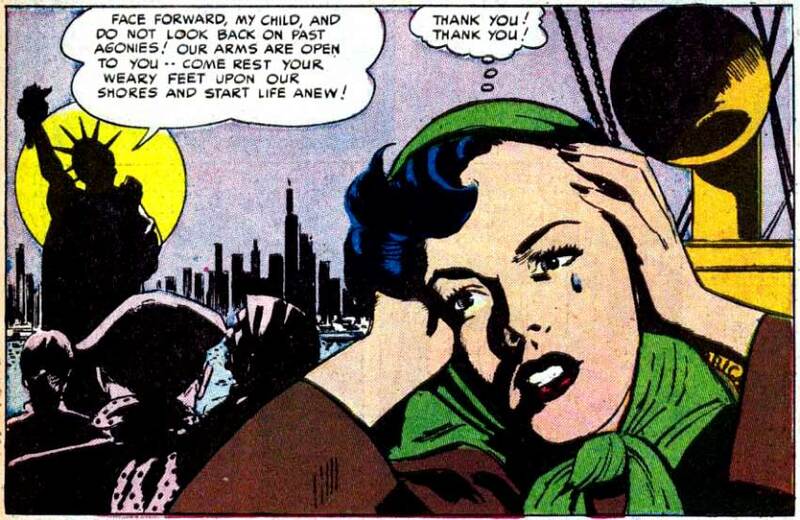 Art by Irv Novick from the story “My Borrowed Kisses” in BEST ROMANCE #7, 1952. 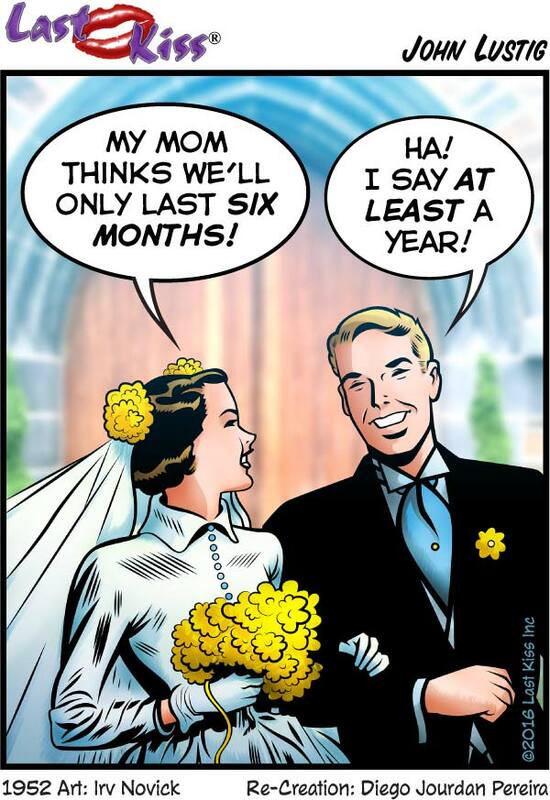 BRIDE: My mom thinks we’ll only last six months! GROOM: Ha! I say at least a year! It’s been used on a variety of merchandise over the years. And a lot of people have assumed I wrote it. Nope. I wish I had. I hope whomever did create it got fabulously rich—before the image got ripped off, re-drawn and re-used countless times. But, no—it wasn’t me. However, I thought it was high time that I did my own version—with a bit of a twist, of course. 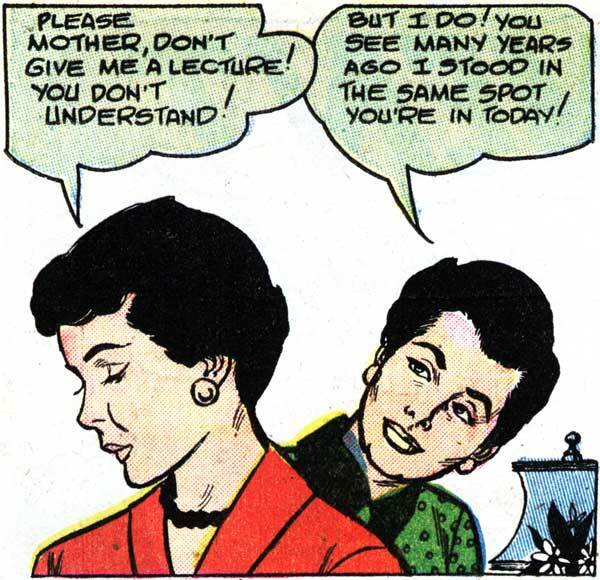 Art by Alice Kirkpatrick from the story “Claimed by the Past” in CINDERELLA LOVE #11, 1952. 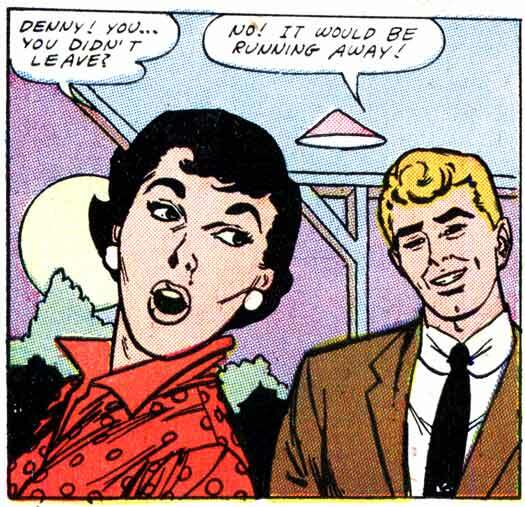 SCARF-Wearing WOMAN (who’s very upset): Oh, no! 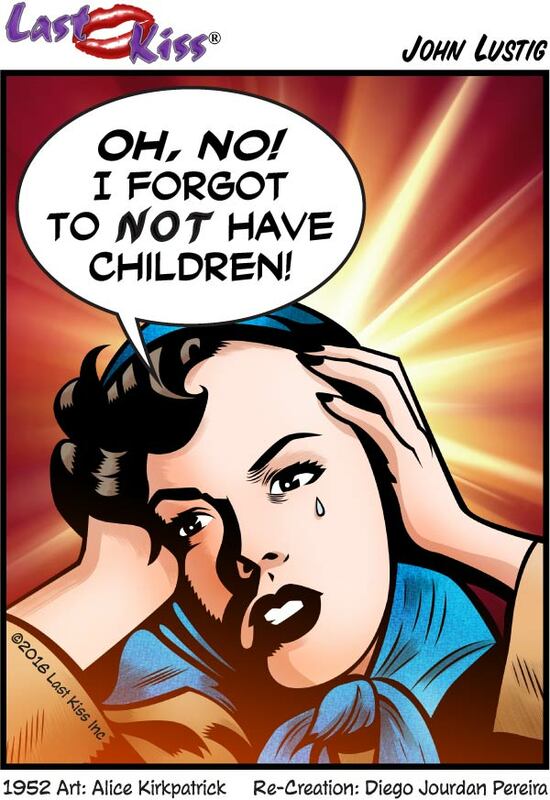 I forgot to not have children! SCARF-Wearing WOMAN (who's very upset): Oh, no! 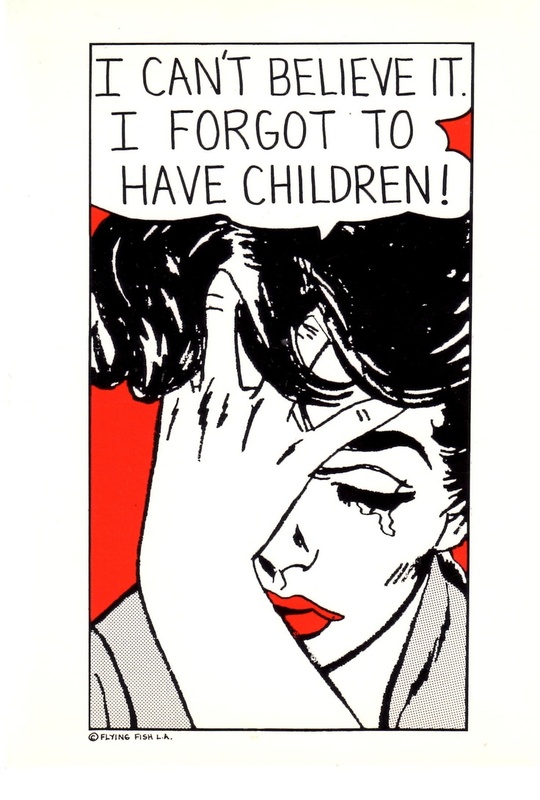 I forgot to not have children! Welcome (and goodbye) to the family! Art by John Tartaglione from the story “To Stella with Love” from FIRST KISS #3, 1958. MAN TO WOMAN: Cheer up! 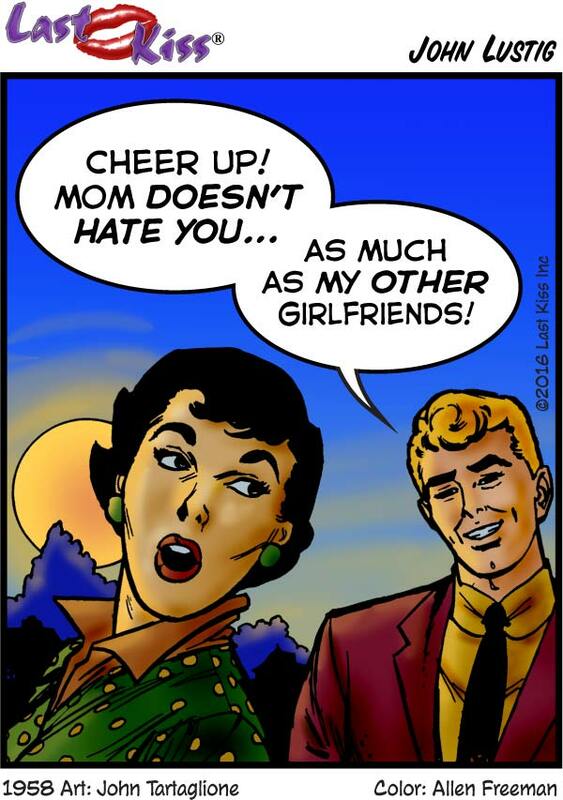 mom doesn’t hate you…as much as my other girlfriends! 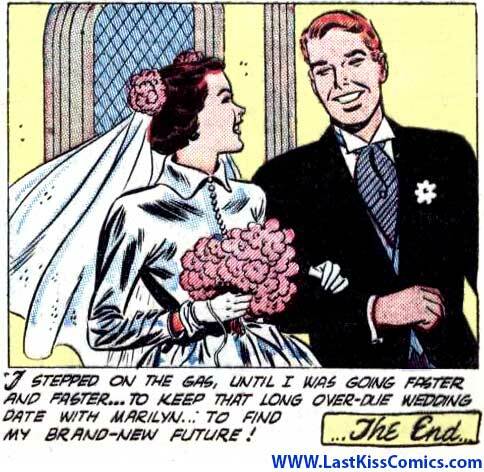 Art by John Tartaglione from the story “Elopement” in FIRST KISS #4, 1958. ADULT DAUGHTER: Oh, Mom! Were boys this much trouble when you were a girl? 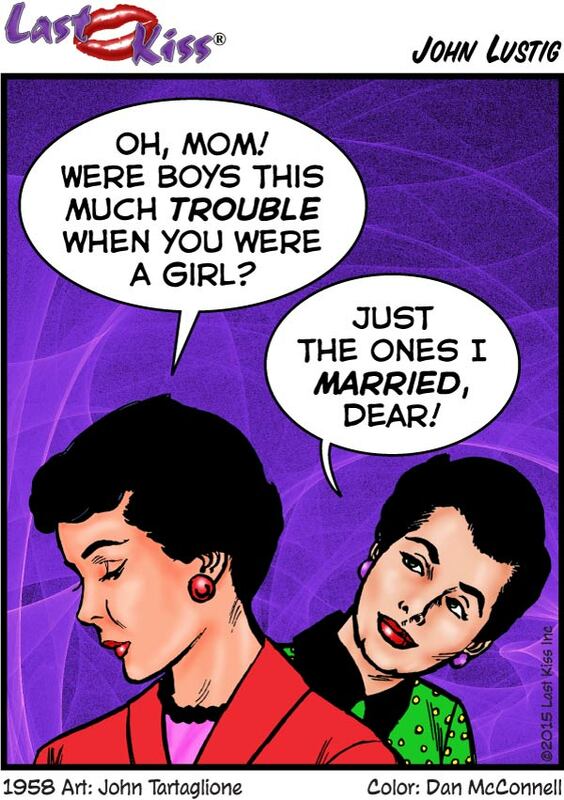 MOTHER: Just the ones I married, Dear!